Weighted Sandbox Covers can either come as water-proof vinyl coated fabric or a super-durable industrial mesh material addition. Both come with their own uses and pros/cons! Water-Proof Vinyl :: As the name suggests, it is completely waterproof! If you want to keep your sand as dry as possible, consider this sandbox cover as the cover for you! At larger sizes, heavy rain and snow can cause water to pool at the center of the cover, making removal of the cover more challenging and messy. Pooling can be mitigated by keeping your sandbox full of sand or “propping” up the center of the box so the water slides off-try a beach ball or a pail! Super-Durable Industrial Mesh :: This cover allows moisture through, but is designed to be virtually tear-proof. The bright-side is, that means the water will not pool on the cover, meaning no hassle to remove the cover after a large amount of rain and no pooling mitigation necessary! Keep in mind, some moisture in the sand does not have to be a bad thing! Moisture in the sand will cause the sand to be damp and mold-able, allowing kids to make shapes easier and even make sand castles. Price Difference? Do not be fooled, both materials are quite durable! At larger sizes (above 8’x8′) the Super-Durable Industrial Mesh tends to be slightly higher priced than the Water-Proof Vinyl. The Super-Durable Mesh is woven tightly with microfibers, causing slightly larger manufacturing expense at larger sizes. However take note there is no price difference up to and including 8’x8′, allowing the freedom of choice for sizes 8’x8′ and smaller! For more details on price estimates and materials, keep scrolling! Do you want a sandbox cover in a different size? Place an order by phone at (877) 840-0707 or fill out our Estimate Request Form! This hands-free sandbox cover is the sand solution that you’ve been searching for! These covers are made from tough vinyl, the same fabric you see on the sidelines on college and pro football fields that 300-pound linemen stand on. The outside edges of the sandbox covers have a length of chain sewn into them all the way around. The edges hang over the 4 sides of the sandbox, and they weigh the cover down. It’s the easiest sandbox cover on the market. Ours are easier to cover and uncover. No snaps, ties, or cords needed. Ours don’t get sand stuck in attachments. Other covers’ snaps and ties get clogged up with sand. No clips! No snaps! No strings! Just place the cover over your sandbox and let the weighted edges hang over the sides. The lengths of chain sewn into the outside flaps hold the cover in place. No fuss, no muss! Our weighted edge sandbox covers serve many purposes. First, they keep sand and sand toys in the sandbox, so they don’t blow away. Second, they keep the sand dry — no rain or moisture gets in (although you can also buy our weighted edge covers with a part-mesh design, to let moisture through). Third, sandbox covers keep the sand clean by preventing certain things from accessing the sand, including animals, sticks, and branches. Fourth, our covers protect the sandbox surface, which prevents mold and rot on wooden surfaces. And finally, our sandbox covers just look good! Our covers are the best value on the market for usability, durability and protection! Full vinyl. 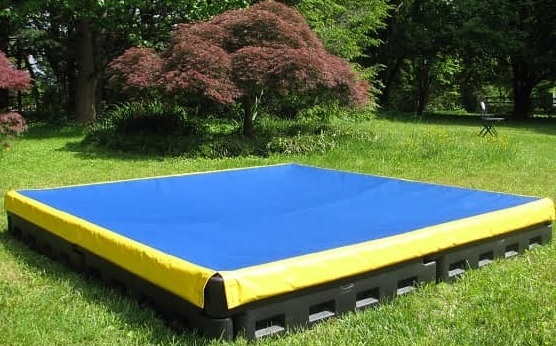 These sandbox covers are completely waterproof, made from one piece of vinyl. Vinyl with mesh interior. These sandbox covers are made from one piece of vinyl, with a mesh center that lets water through. A close-up photo of the corner of the Magic Sandbox Cover, showing the weighted flaps at the corner of the sandbox. Full vinyl covers: Available in solid green or blue, with or without a yellow safety strip. You can order other colors by special order. We can even imprint your organization’s logo on the cover! Vinyl with mesh interior covers: If you choose a vinyl cover with mesh interior, the vinyl is available only in color yellow. You can choose from 3 different colors of mesh interior: black, royal blue, or forest green. In the full vinyl weighted edge sandbox covers, the fabric is heavy duty vinyl. It is completely resistant to water. 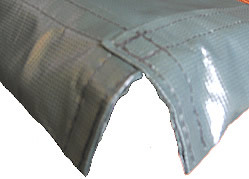 In the vinyl-and-mesh coverweighted edge sandbox covers, 2 fabrics are used: 1. heavy duty vinyl, and 2. mesh made from industrial matrix fabric. It’s the same kind that football teams use to protect the grass around the team benches during games. If a group of football players wearing cleats won’t hurt the fabric, then it’ll do just fine on your sandbox! Just place the cover over your sandbox and let the weighted edges hang over the sides. The weight holds the cover in place. This overhead diagram of our Magic Sandbox Cover™ shows how the flap system works. For all of our weighted edge sandbox covers, you can order any size you like, as small or as large as you need. Standard sizes for sandboxes include 4′ x 4′, 5′ x 5′, 8′ x 8′, and 12′ x 12′. We custom make sandbox covers for any size sandbox, based on the measurements that you provide us about the outside length and width of the sandbox. Please note that each Magic Sandbox Cover has an additional 6 inches of fabric hanging over each side, with a length of steel chain sewn in. So, a cover for a 4′ x 4′ sandbox actually measures 5′ x 5′ (the extra foot is the 6 inches that hangs over each side of the sandbox). After you order, we will send you a Confirmation Sheet to complete, on which you list the sandbox’s specific measurements and your preferences for color, overhang length, and whether you want waterproof or permeable mesh material. Installing our weighted edge sandbox covers is a cinch. That’s because there’s no handles, snaps, or cords. You simply place the cover on your sandbox and hang the edges of the cover over the sides of the sandbox. Because the flaps of the sandbox cover have steel chain sewn into the outside edge, all the way around, that weight holds the cover in place. The weighted edge sandbox covers are delivered in 14 – 21 days, from the day you place your order. It takes this long because each cover is custom-cut, to the exact dimensions of your sandbox. The following price list for our weighted edge sandbox covers refers to several standard sizes of sandboxes. For other sizes, please phone us for a price quote. Free Shipping in the Contiguous US on all Sandbox Covers! *These sandbox covers are custom-made, based on the measurements provided by the customer. So, please measure the sandbox to obtain an accurate measurement of the outside dimension of the sandbox. We disclaim liability for sandbox covers manufactured based on incorrect measurements by customers. Thank you for understanding. Do you have any questions about our sandbox covers or would like to place an order by phone?